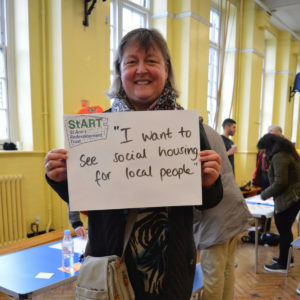 Tottenham community group St Ann’s Redevelopment Trust (StART) calls on GLA to rule out Shared Ownership on the Mayor’s flagship housing site. The GLA is set to sell a huge housing development site in Tottenham, recently purchased as part of the Mayor’s plan to use public funds in tackling the Capital’s housing crisis and provide affordable homes. But, out of the 50% earmarked as affordable homes, only a fraction of them will be genuinely affordable to local residents. On a site that could see up to 800 new homes built in Tottenham, North London, the GLA has promised to ensure that any private contractor must build affordable housing as part of the deal. 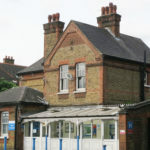 Local residents welcomed the move and in July 2018, local campaign group, St Ann’s Redevelopment Trust (StART) signed a Memorandum of Understanding with the GLA, giving the community a seat at the table in decisions about the St Ann’s Hospital development. 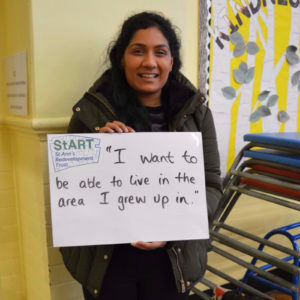 However, StART believes the inclusion of Shared Ownership undermines the prospect of genuinely affordable homes in Tottenham. ‘Genuinely affordable’ is generally agreed to mean a third of the local gross household income. For large parts of Haringey and other parts of London this means a rental/mortgage level no higher than about £950 a month for a two-bedroom home. Recent shared ownership homes near to the St Ann’s site have gone on the market with the rent/mortgage at around £1,600. The average income in Tottenham is nowhere near that level. Haringey Council states, ‘of all Inner London boroughs, Haringey has the largest proportion that are earning below the London Living wage (32%)’. A recent Freedom Of Information request revealed 48% of Haringey residents have no savings or are in debt and are therefore unable to afford the deposit required for Shared Ownership; this figure is higher among BAME communities. This means the inclusion of Shared Ownership as part of a housing development in an area like Tottenham has huge implications for Haringey’s diversity.